The first leg of the Spanish Super Cup ended with a 1-1 draw, with both Real Madrid and Atletico struggling to show their best versions. The Merengues scored first through a right-foot strike from James Rodríguez already inside the last 10 minutes of the game, but Diego Simeone's men still found the time to reach the equalizer, just two minutes before the end of the regular time. 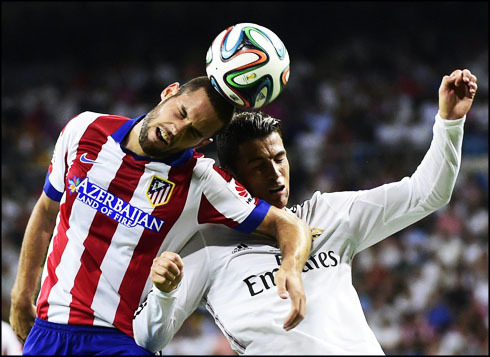 All decisions were delayed to the 22nd of August, since neither Real Madrid nor Atletico Madrid proved to be capable of beating the other in a convincing manner. The two sides walked off the Santiago Bernabéu in the Spanish Super Cup first leg with a 1-1 draw, knowing they'll be meeting again in just 3 days from now in the Vicente Calderón, in order to determine who takes home the first trophy of the season in Spain. With Cristiano Ronaldo only fit to play in the first 45 minutes due what seems to be a small injury in his left leg, it would be James Rodríguez scoring the only goal for the Merengues near the 81st minute of the game. Atletico still managed to react before the final whistle though and tied the clash in the 88th minute following a classic set-pieces play where they've caught Real Madrid's defense sleeping. You can watch Juventus live stream, Atletico Madrid vs Real Madrid in the return leg this Friday night through a live streaming online, but also in Sky Sports 5 if you're in the UK, or in ESPN 2 if you're living in the United States. The first half at the Santiago Bernabéu was a bit disappointing to say the least. Neither side managed to really bother the other and Real Madrid even went into half-time without yet hitting the target. Carlo Ancelotti's men were getting plenty of problems to breach into Atletico's well organized block and it wasn't really that surprising to see that we had a goalless draw in the scoreline when we reached the break. If there's something that hasn't changed much from last season, that's definitely the way the Atletico defends and how compact they are when they group at the back. The game resumed with what must be considred a very worrying note for the Madridismo. 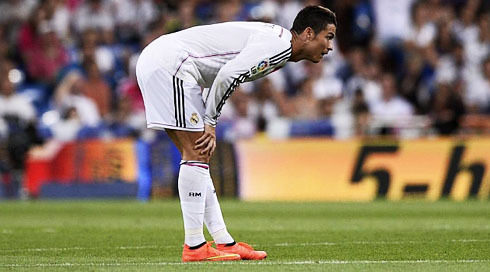 Cristiano Ronaldo didn't return to the field for the second half, after having allegedly felt some pain his left leg. Ancelotti replaced the Portuguese ace with the club's new signing James Rodríguez, and the truth is that the Colombian ended up having a key role in the 45 minutes we still had left in this Spanish Super Cup first leg tie. The opening goal arrived quite late in the game, with Real Madrid only taking the lead around the 81st minute and following a loose ball inside Atletico Madrid's box that James Rodríguez was keen to capitalize on. The former AS Monaco midfielder saw Karim Benzema struggling to hold on to the ball after a low cross from the right and as he approached his teammate in hopes of being assisted, a bad clearance from an opponent sent the ball straight his way and allowed him to strike it with his right-foot. The shot still got deflected in a defender's leg, but it went past everybody and only stopped at the back of the net. It was undoubtedly a very important goal for the hosts and also James Rodríguez first goal for Real Madrid. However and as we've seen numerous times last season, Diego Simeone's Atletico isn't the type of team who drops its arms that easily. 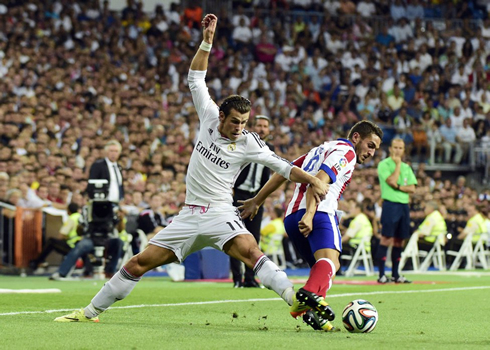 The Colchoneros levelled things up near the 88th minute, following a corner kick on the left side of the attack. Koke crossed it to the near post and Real Madrid's apathy to attack the ball allowed for Mario Suárez to slightly deflect it without even taking his feet off the ground and then for Raúl Garcia to easily push it into the back of the net when he was just a few inches away from the goal line. Not much that Iker Casillas could have done there and Atletico had basically secured what could end up being a crucial away goal in this 2-leg tie. As for Cristiano Ronaldo injury, the latest reports gathered shortly after the game was over seem to suggest that it wasn't anything very serious and that he might be fit to already play against Atletico Madrid in the second leg, this next Friday (August 22). Ancelotti confirmed that Ronaldo was feeling some muscular fatigue in his left leg at half-time (near the left knee where he had several injury problems over the last few months) and that everyone felt it would be more wise to take him off the game and spare him in the second half. Cristiano Ronaldo next game for Real Madrid will be against Atletico Madrid, for the second leg of the Spanish Super Cup, on August 22. You can watch Juventus live stream, Atletico Madrid vs Real Madrid, FC Barcelona vs Elche, Chelsea vs Leicester City, and Everton vs Arsenal, all matches provided from our soccer live pages.